A perfect day trip from Reykjavík, Iceland’s Golden Circle is packed with what makes the island nation so special: immense beauty, a go-at-your-own-pace style of adventure and perplexing geologic features that are oftentimes close enough to touch. A drive along south central Iceland’s Golden Circle can be completed in just a few hours and there’s no wrong way to do it—hit the road, stop where you want for as long as you want and then move on. Here are a few highlights you’ll find along the Golden Circle route. Start the day off near your home base, likely somewhere in or near Reykjavík. Get fueled at Reykjavík Roasters, an independent coffee shop known for its lovingly crafted lattes and cappuccinos. True aficionados, they offer workshops and classes about the best at-home brewing methods and coffee’s journey from manufacturer to consumer. The second tallest building in Iceland, Hallgrímskirkja, opens at 9 a.m. and is a quick 12-minute walk from Reykjavík Roasters’ location on Brautarholt. After breakfast, take in the best view (pictured above) of the city—including the harbor, foot traffic below and a host of colorful rooftops—from the church’s viewing platform nearly 250 feet up. It’s fitting that Þingvellir would be a visitor’s first stop out of Reykjavík along the Golden Circle. It’s a UNESCO World Heritage Site and where Iceland all began. In 930 AD, Alþingi—one of the oldest parliamentary institutions in the world—was founded here. It marked the birthplace of a nation. Visitors can stroll through miles of trails and enjoy expansive views of the Icelandic countryside, waterfalls, lakes and canyons while they do. The most incredible part of Þingvellir is that it houses the crest of the mid-Atlantic Ridge, part of the longest mountain chain in the world. More than 90 percent of the ridge’s 40,000-mile length lies deep under the Atlantic Ocean, but here, at Þingvellir, it sprouts out of the earth above land. You can see it, touch it and stand between two continental plates. You can even suit up and snorkel between the plates at Silfra Lake, a rift formed by the tectonic boundary. Efsti-Dalur II is a working farm and bed-and-breakfast, but what you really need to know is that it’s a one stop shop for good feels while you’re out on the open road. If it’s lunchtime by the time you pull up, the restaurant’s tasty burger goes well with an Einstök Toasted Porter or a cocktail featuring one of 64° Reykjavík Distillery’s fruit-forward liqueurs (only if you’re not the driver, though). Lunch or not, ice cream is a nonnegotiable—homemade, delicious and dished up in a room overlooking the cows who aided in its creation. They’ve got a stable of ponies that are ready to ride, but if you’re short on time, walk over to the barn and say hello while you finish up your waffle cone. As you approach Strokkur, you might notice little bursts of steam rising from the landscape through cracks and fissures in the rocky soil. You’re almost there. The massive geyser sits on a geothermal field and, every few minutes, its scalding hot waters spurt up and out with serious force—reaching heights of nearly 100 feet. The first geyser known to modern Europeans, the Great Geysir, sits nearby. It’s bigger, but its eruptions are less frequent. If you’re not crunched for time, spend an extra hour or so climbing Laugarfjall hill for views-on-views of Iceland’s southwestern interior with exploding geysers in the foreground. It’s free and a great way to stretch your legs in between Golden Circle stops. This double-decker beauty is the furthest point away from Reykjavík that you’ll get on the Golden Circle. Even still, if you drove from the capital to this expansive, tiered waterfall directly, it’d take just an hour and a half. One of the most popular tourist destinations in the country, Gullfoss’ beauty and grandeur attract 300,000 people each year according to the Iceland Nature Conservation Association. For a moment, before you get jabbed with a fellow traveler’s selfie stick, let yourself get lost in the water’s zigzag pathway through a 66-footwide canyon—part of the Hvítá River that originates on a nearby glacier. Disrobing in the middle of Iceland’s rugged terrain might seem counterintuitive, but when you dip your toes into the Secret Lagoon’s warm waters, everything will make sense. Iceland is dotted with natural hot springs and heated baths because the region’s geothermal activity heats the groundwater. The Secret Lagoon is more remote than the Blue Lagoon, a mainstream option near Keflavík Airport. It’s more cost-effective, too—standard entry into the Blue Lagoon starts at $52, while adult admission to the Secret Lagoon is around $25. If you’re looking to shake a case of the shivers, make like a tomato and get to Friðheimar (not a saying? We tried). Even locals rave about this family-owned and operated fully indoor tomato farm that’s famous for its abundant annual harvests (370 tons or nearly 20 percent of the country’s entire tomato crop) and its tomato soup served on-site with homemade bread and cucumber salsa. The farm and its restaurant, founded in 2002 and 2012, are both located inside a tropical-feeling greenhouse where the temps are kept toasty. Most of Iceland’s sweeping natural features will make you feel small. Kerið is no exception. A caldera is formed when volcanoes erupt and then, without sufficient structural support, collapse into themselves leaving a massive depression at the surface. The 180-foot deep cater is just off Route 35. The water at its base is mostly groundwater—not rainwater. Whether you’re a geology buff or not, the vastness of Kerið’s teal, silica rich waters and vibrant rust red earth are well worth the stop. Located on private land, don’t skip paying your 400 ISK—$4 USD—to see (and likely Instagram) this highlight. The town of Selfoss might lay a smidge outside of the Golden Circle, but you do you on the Golden Circle. Selfoss is close enough and worthy of mention. 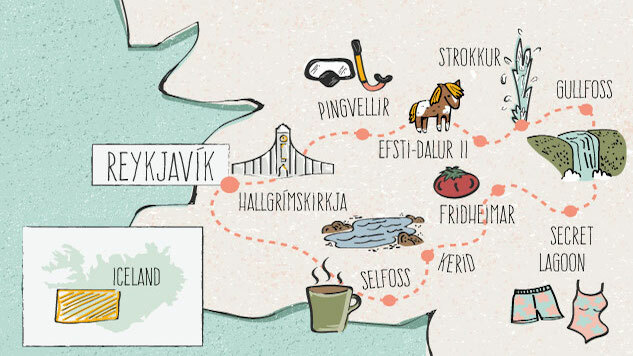 With the exception Reykjavík, Selfoss will be the largest town you see today. With a population just north of 6,500, it will feel like a bustling metropolis compared to the other pit stops along your route. There are horseback riding tours, nature and wildlife tours and Icelandic turf houses in and around Selfoss. For something a little more relaxed, hop off the highway and into Kaffi Krús, a cozy coffee shop and restaurant located in a bright yellow building. Latte and slice of cake in hand, walk a block north for a stroll along the rushing Ölfusá River, Iceland’s largest river by volume, before hitting the road again. Kelly Knickerbocker is a Seattle-based writer with Texas roots.